Recently I have been in Antequera, a town in the province of Malaga, and it really got over my expectations. It is possible to find buildings, structures and remains from all the historical periods: the oldest ones are the neolithic dolmens of Menga, Viera and El Romeral. It is also a very important monumental town, with churches and convents all around, and the Alcazaba is well conserved. Really I do not know why Antequera is not as the same level as cities like Seville, Cordoba or Ronda in cultural tourism. Moreover, the Protected Natural Space of El Torcal is very close to the urban area and it is a perfect place to enjoy the Nature and the spectacular karst landscapes. Dolmens, Torcal and Peña de los enamorados (The Lovers’ Rock) were declared UNESCO World Heritage sites in 2016. The famous Caminito del Rey (king’s path) is also in Antequera. But I will never walk that path, I could die of a heart attack. Caminito del Rey is only for brave people who are not afraid of heights. Anyway, sadly I was in Antequera just for a day and we only could visit the Alcazaba and some of the historical buildings around. The Old Town is really big and completely full of monuments, look what a map they gave me in the tourist information office, and we just visited the left part of the map. Our itinerary started in the Gate of Granada and continuing along Belen St. where we saw the Convent of Belen, the church of Santiago and the Convent of Saint Eufemia (17th-18th century). What I really liked was the baroque style in heavy decoration and specially the beautiful colours decorating walls, ceilings and altarpieces. Antequera is also called the city of the churches or the baroque city. We continued our way and we saw more churches and convents but we did not visit their insides as we thought we would never finish. From Descalzas Sq. to San Sebastian Sq. we passed the convent of the victory, the palace of the Marquis and Marchioness Lovers’ Rock, the church of Saint Joseph, the convent of Saint Catalina and the church of Saint Sebastian, this one with a beautiful golden weather vane. From here we started to walk up the ramps to visit the Alcazaba. The Alhambra of Granada, for example, is an Alcazaba, but in Seville we have an Alcazar as it is only the palace of Peter the 1st. The words alcazaba and alcazar come from Arab language because those constructions are originally from the Al Andalus period. After the conquest they were used and rebuilt by Castillian royalty or nobility. Apart from the towers and walls in the Alcazaba of Antequera there are also some remains from houses, mosque and tanks. The speech of the audio-guide focuses in the Conquest by Prince Ferdinand in 1410, later called Lord of Antequera, and even if they mainly follow the official history, miraculously they say “Conquest” and not “Reconquest”. Saying reconquest is like considering Al-Andalus not part of our history, but it is. Al-Andalus was not something that came from a foreign country and after 8 centuries was recuperated by any inner civilization. Al-Andalus was our civilization since the 8 th century and later destroyed by the kingdom of Castilla. In the White Tower of the Alcazaba there is a room that looks towards Peña de los Enamorados. It is also called The head of the Indian man due to its shape, but the name comes from a dramatic love story about a Muslim woman and a Christian man who fell in love. There are different versions of this legend, I will explain the one I like because in this one the woman is not passive and kidnapped by her lover. It is said that during the Conquest times a Castillian soldier, whose name was Tello, was caught by the Nasrid kingdom and he was in the jail of Antequera. The daughter of the Muslim king, called Tazgona, visited the Christian soldier and they quickly fell in love. They finally escaped from the town and when the Muslim king knew about it he sent a troop to recuperate his daughter. At the same time, the army from Castilla was coming to prepare a siege for Antequera. The lovers saw no way to be free, so they committed suicide throwing themselves from the rock. Since then, the rock is called Peña de los Enamorados (Lovers’ Rock). This legend can be find also in the house of Blas Infante. In the area of the Alcazaba roman ruins of a public bath were found. As I said at the beginning of this posts, in Antequera there are from all the historical periods, and its name comes from the Roman period: “Antikaria” which means “ancient town”. Next to it a collegiate church was built by the order of the Prince Ferdinand. The main style is renaissance, but there are also some details from gothic and baroque styles. Moreover the ceiling is totally mudejar style. Finally we had lunch in Meson Iberico Dehesa las Hazuelas. As we were 4 people we could taste a lot of tapas and dishes: rice with meat and seafood, porra (called salmorejo in Cordoba and it is a cold tomato soup heavier than gazpacho), baked hake, carrillada (stewed pork cheek) and lagarto on the grill. Lagarto literally means lizard, but we did not eat any reptile. It is also the name given to the meat between the ribs and the loin of the pork. It was my favorite dish. Our red wine was Pernales, a D.O. Sierras de Málaga. It really liked me. I was surprised that in this restaurant there were bottles of a lot of Andalusian wines to choose, but if you only want a glass, the only option was Pernales. The rest were (as usual) rioja or ribera. We started to have lunch too late, at 3.30pm, and when we finished it was too late to visit the dolmens (they close at 6 pm). So we went to a cafeteria to taste the famous bienmesabe. Antequera is very well known because it is the origin of mantecaos and polvorones but it also has much more sweets to try. In some of the convents, and remember there are a lot in this town, the nuns sell, among other sweets, roscos, magdalenas and bienmesabe too. Bienmesabe, the most typical in Antequera, literally means “it tastes good to me”. The main ingredients are toasted almonds, eggs, sugar, cinnamon and spaghetti squash jam. By the way, in Cadis there is also bienmesabe, but it is a kind of fried fish. Sometimes the same word means things totally different depending on the place you are. As I posted on my twitter when I was going back home, only a day in Antequera is not enough. I think that it is necessary to stay at least a night there. Moreover it is easy to go there from Seville, Cordoba, Malaga and Granada by car, train or bus; no more than 2 hours from every place because of its central location. 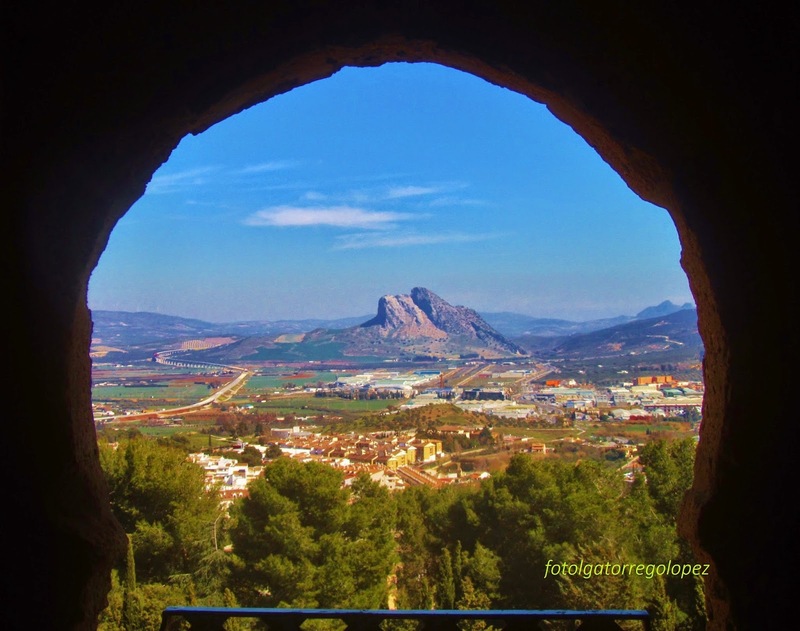 As the tittle of this post says: Antequera is the heart of Andalusia. We live only about 30 minutes from the town but have never visited it properly. You have inspired me to make the effort! Sure! You have to go! In case you are interested on visiting also el torcal probably you will need to bring lunch with you as now in winter sunset starts very early. A picnic there could be nice. You live close so you can go more days to see more things 🙂 Thanks a lot for your comment!